INVEST IN YOURSELF BEFORE IT’S TOO LATE! Ooooh fighting your lower nature is not easy, appetite is part of our animal instinct, and it’s a survival instinct. I really want some fried greasy refine carb breakfast like a fried egg sandwich with olives and a coffee, however one of my body control techniques is “you can have that but have something healthy first”. Sulky I mooched to the kitchen seeing soaked sesame seeds and dandelions in clean water and knew that they had to hit the blender. That fried egg sandwich was becoming a faint desire, praise the Creator. As I was getting ready, music to my ears was my neighbors Vitamix was in full swinging, a sign!!!! I was doing the right thing; invest in yourself before it’s too late. Good for is your health insurance Insha’Allah, trust in Allah and tie up your camel. Smoothies can be prescriptive like this one, addressing health issues. 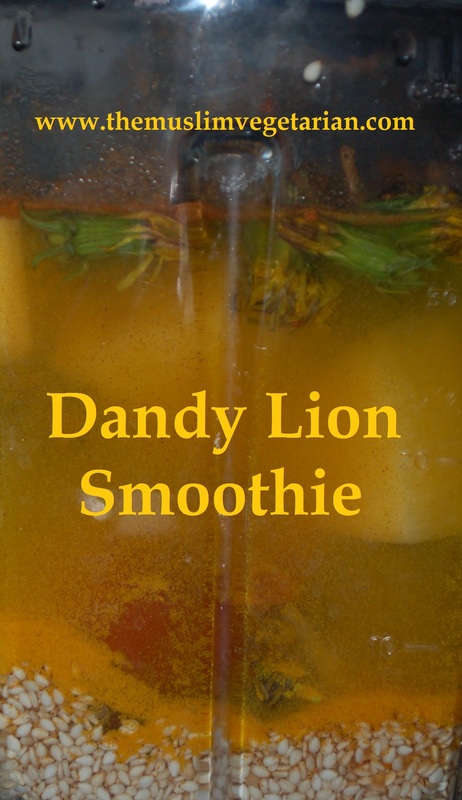 Dandelions, good for liver, digestion, regulates blood sugar, lows black pressure. Sesame seeds(soak over night) good for strong bones, hair skin.